Boaters searching for Columbia River boat slip rentals will find Big Eddy features all the convenience and contemporary amenities you would expect from the area’s leading marina. Floating home residents and boaters prefer the marina because of its peaceful, serene setting. As a private and gated community, Big Eddy enables you to come and go without a worry. And when you are ready to go out on the river it couldn’t be easier. What makes Big Eddy so appealing to sports fishermen and boaters alike is how little time it takes to get on the river. Unlike a public boat launch, you don’t spend any time waiting to get on the launch, putting your boat in the water and then searching for a safe place to park your vehicle and trailer. Big Eddy Marina is not involved in fuel, boat parts or licensing. 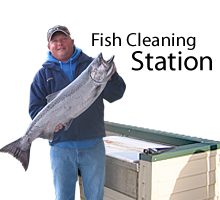 Big Eddy makes life easy for fishermen with a modern fish cleaning station available for tenants renting boat slips at Big Eddy Marina. What’s more, the State of Oregon designated Big Eddy as a certified Clean Marina, which means Big Eddy Marina works to protect and improve local water quality by promoting the usage of environmentally sensitive practices. Nice work!